The Edicts of Ashoka are a collection of 33 inscriptions on the Pillars of Ashoka, as well as boulders and cave walls, made by the Emperor Ashoka of the Mauryan dynasty during his reign from 272 to 231 BCE. These inscriptions are dispersed throughout the areas of modern-day Pakistan and northern India, and represent the first tangible evidence of Buddhism. The edicts describe in detail the first wide expansion of Buddhism through the sponsorship of one of the most powerful kings of Indian history. According to the edicts, the extent of Buddhist proselytism during this period reached as far as the Mediterranean, and many Buddhist monuments were created. The inscriptions proclaim Ashoka’s beliefs in the Buddhist concept of dharma («righteousness») and his efforts to develop the dharma throughout his kingdom. Although Buddhism and the Buddha are mentioned, the edicts of Ashoka tend to focus on social and moral precepts rather than religious practices. No mention is made of the philosophical dimension of Buddhism, such as the Four Noble Truths or the Eightfold Path. This could possibly be because Ashoka wanted to remain simple in his message to the public, because these notions may have been formalized at a later date, or some combination of the two. 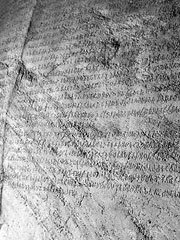 In these inscriptions, Ashoka refers to himself as «Beloved of the Gods» and «King Priya-darshi.» The identification of King Priya-darshi with Ashoka was confirmed by an inscription discovered in 1915. The inscriptions found in the eastern part of India were written in the Magadhi language, using the Brahmi script. In the western part of India, the language used is closer to Sanskrit, using the Kharoshthi script, and one bilingual edict (Edict 13) was written in Greek and Aramaic. The inscriptions revolve around a few repetitive themes: Ashoka’s conversion to Buddhism, the description of his efforts to spread Buddhism, his moral and religious precepts, and his social welfare program. In order to propagate the Buddhist faith, Ashoka explains he sent emissaries to the Hellenistic kings as far as the Mediterranean, and to the peoples throughout India, claiming they were all converted to the Dharma as a result. He names the Greek rulers of the time, inheritors of the conquest of Alexander the Great, from Bactria to as far as Greece and North Africa, displaying an amazingly clear grasp of the political situation at the time. Antiochos refers to Antiochus II Theos of Syria (261-246 BCE), who controlled the Seleucid Empire from Syria to Bactria, in the east from 305 BCE to 250 BCE, and was therefore a direct neighbor of Ashoka. Ptolemy refers to Ptolemy II Philadelphos of Egypt (285-247 BCE), king of the dynasty founded by Ptolemy I, a former general of Alexander the Great, in Egypt. Alexander refers to Alexander II of Epirus (272-258 BCE). It is not clear in western records whether these emissaries were actually received, or had any influence on the western world. Some scholars however point to the presence of Buddhist communities in the Hellenistic world from that time, in particular in Alexandria (mentioned by Clement of Alexandria). The pre-Christian monastic order of the Therapeutae may have drawn inspiration for its ascetic lifestyle from contact with Buddhist monasticism. Buddhist gravestones from the Ptolemaic period have also been found in Alexandria, decorated with depictions of the Wheel of the Law (Tarn, «The Greeks in Bactria and India»). Commenting on the presence of Buddhists in Alexandria, some scholars have even pointed out that “It was later in this very place that some of the most active centers of Christianity were established” (Robert Linssen). The Cholas and Pandyas were south Indian peoples living outside Asoka’s empire. Tamraparni is the ancient name for Sri Lanka. Kambojas are a people of Central Asian origin who had settled first in Arachosia and Drangiana (today’s southern Afghanistan), and then in the northwestern Indian subcontinent in Sindhu, Gujarat and Sauvira. The Kambojas also later designated populations in northwestern Thailand, so there is a possibility that this mention relates to the prolytisation of the Mons. The Nabhakas, the Nabhapamkits, the Bhojas, the Pitinikas, the Andhras and the Palidas are other people under Ashoka’s rule. Ashoka showed great concern for fairness in the exercise of Justice, caution and tolerance in the application of sentences, and regularly pardoned prisoners.